So what’s next? Well, I’d planned to stop climbing 8000ers after this expedition and I see no reason to revise that. As of now, I’m retired from the death zone. Back in Kathmandu, enjoying the questionable delights of civilisation; horns, pollution, crowds, heat and flies. Thankfully, no giant bats. First up, no. I turned around at 8500 metres, just a few hundred metres from the summit, due to some early but very strong signs of HACE (high altitude cerebral oedema). Symptoms – double vision, vomiting, micro sleeps (whilst climbing! ), falling and hallucinations (giant bats). Looks like a good weather window opening on 25th, 26th and 27th. i’ve had a wash so there’s little more to do here in basecamp. heading up tomorrow. back in a week or so. We’ve been hearing stories of expedition’s cancelling on the south (Nepal) side of the mountain due to rock fall; a result of the very dry season. On our side however, the mountain conditions are ok. Our biggest issue is the wind. Back in basecamp day before yesterday but only now getting communications. Thanks to all who sent best wishes and apologies for not replying – email is almost impossible to operate this year. I’ve travelled overland from Kathmandu across the border into Tibet via Xangmu and then spent a few days in Nyalam and Tingri, hill climbing, acclimatising and doing my utmost to avoid the local food. With limited success unfortunately, as there is little else. 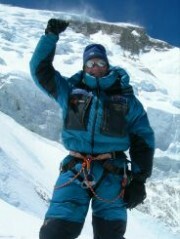 Summitted the true summit of Shishapangma at 5.05pm, 2nd October, with Neil Ward. Very tough climb via a variation of the Inaki route on the north face, caught in a storm on descent with an open bivouac at 7600 metres without equipment thrown in for good measure. Just into basecamp now, bit tired, more later. Ready to go for it. First days on the hill. Hi All a quick note to advise that I’m heading back to Shisha in the post monsoon this year to try and finish the climb to the true summit. I expect to be in Kathmandu on 8 September and then straight to Tibet. Stay tuned.